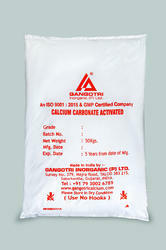 Manufactured in compliance with the industry set norms and guidelines, quality of this Calcium Carbonate Activated never deteriorates. Owing to the finest ingredients used in the best possible combination, the offered product has a longer shelf life and an impeccable effectiveness. Further, the product finds its application in the ISI Grade product where calcium as filler is used in low volume, like Upvc Pipe, pvc compounds, Decorative Paints, Slippers, Costal rubber roll, pvc sheets. Manufactured in compliance with the industry set norms and guidelines, quality of this Calcium Carbonate Coated never deteriorates. Owing to the finest ingredients used in the best possible combination, the offered product has a longer shelf life and an impeccable effectiveness. Further, the product finds its application in the ISI Grade product where calcium as filler is used in low volumes, like UPVC Pipe, PVC compounds, Decorative Paints, Slippers, Costal rubber roll, PVC sheets.